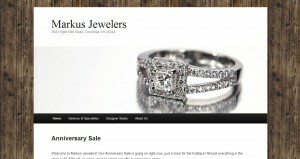 Markus Jewelers address, phone, website, hours of operation, and more. Family owned and operated, Markus Jewelers has been in business for more than 20 years. We specialize in fine jewelry and watches including repairs, custom jewelry design, appraisals. We also buy gold, silver, and coins. Repairs are completed in house by our three full time jewelers. Our sales staff are incredibly knowledgeable and patient, and are happy to work within any budget.